How can I clone an SQL Server database on the same server in SQL Server 2008 Express? I have an MS SQL Server 2008 Express system which contains a database that I would like to 'copy and rename' (for testing purposes) but I am unaware of a simple way to achieve this. I notice that in the R2 version of SQL Server there is a copy database wizard, but sadly I can't upgrade. The database in question is around a gig. I attempted to restore a backup of the database I want to copy into a new database, but with no luck. Open Microsoft SQL Management Studio. Backup original database to .BAK file (db -> Task -> Backup). Create empty database with new name (clone). Note comments below as this is optional. 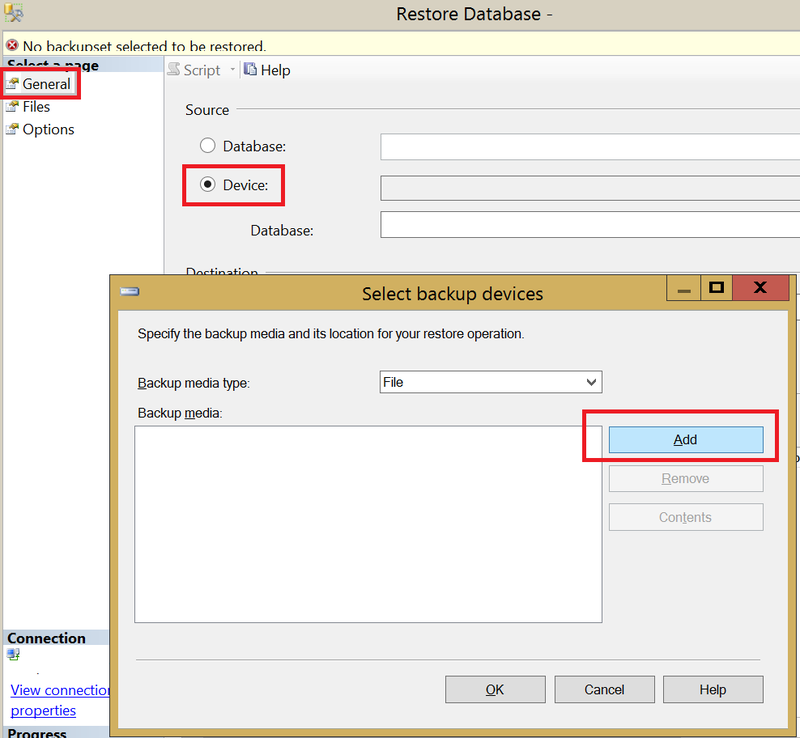 Select Device and add the backup file from step 3. Right-click the database to clone, click Tasks, click Copy Database.... Follow the wizard and you're done. You could try to detach the database, copy the files to new names at a command prompt, then attach both DBs. It turns out that I had attempted to restore from a backup incorrectly. 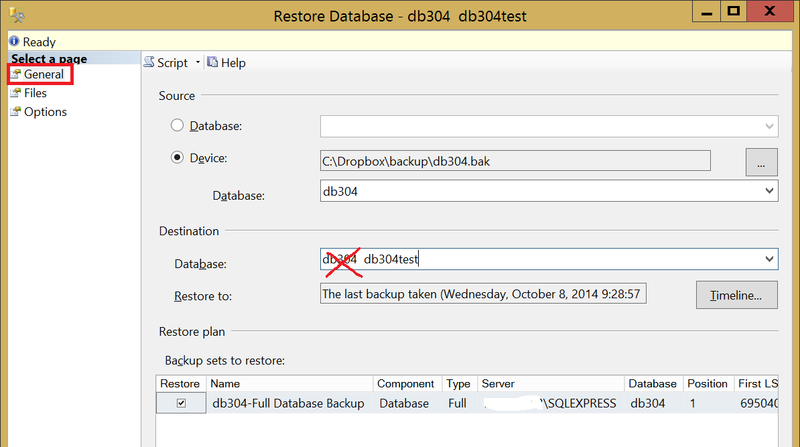 Initially I created a new database and then attempted to restore the backup here. What I should have done, and what worked in the end, was to bring up the restore dialog and type the name of the new database in the destination field. So, in short, restoring from a backup did the trick. This is the script I use. A bit tricky but it works. Tested on SQL Server 2012. None of the solutions mentioned here worked for me - I am using SQL Server Management Studio 2014. Instead I had to uncheck the "Take tail-log backup before restore" checkbox in the "Options" screen: in my version it is checked by default and prevents the Restore operation to be completed. After unchecking it, the Restore operation proceeded without issues. 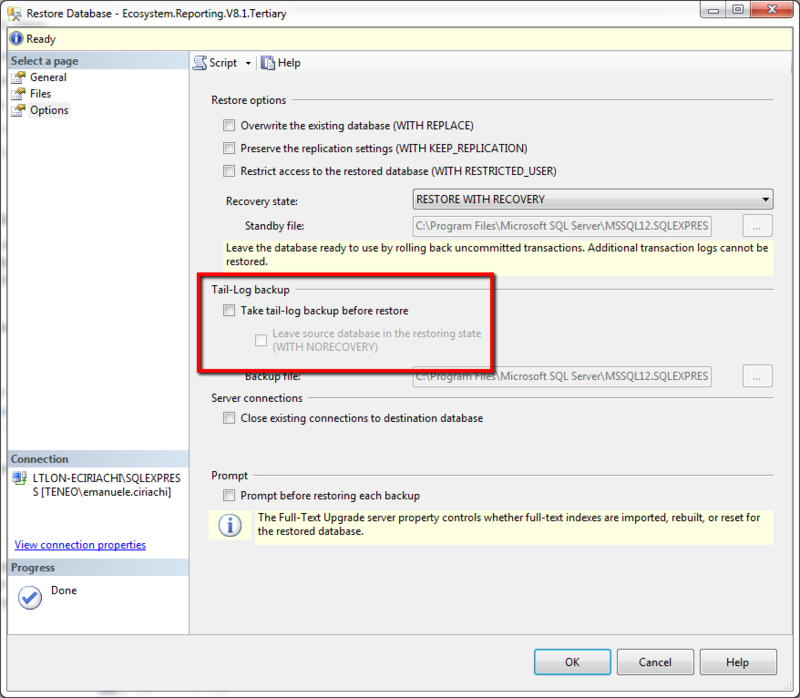 In SQL Server 2008 R2, back-up the database as a file into a folder. Then chose the restore option that appears in the "Database" folder. In the wizard enter the new name that you want in the target database. And choose restore frrom file and use the file you just created. I jsut did it and it was very fast (my DB was small, but still) Pablo. If the database is not very large, you might look at the 'Script Database' commands in SQL Server Management Studio Express, which are in a context menu off the database item itself in the explorer. You can choose what all to script; you want the objects and the data, of course. You will then save the entire script to a single file. Then you can use that file to re-create the database; just make sure the USE command at the top is set to the proper database. You could just create a new database and then go to tasks, import data, and import all the data from the database you want to duplicate to the database you just created. The solution, based on this comment: https://stackoverflow.com/a/22409447/2399045 . Just set settings: DB name, temp folder, db files folder. And after run you will have the copy of DB with Name in "sourceDBName_yyyy-mm-dd" format. Script based on Joe answer (detach, copy files, attach both). Run Managment Studio as Administrator account. It's not necessary, but maybe access denied error on executing. Run script, but type your db names in @dbName and @copyDBName variables before. Not the answer you're looking for? Browse other questions tagged sql-server sql-server-2008-express or ask your own question. 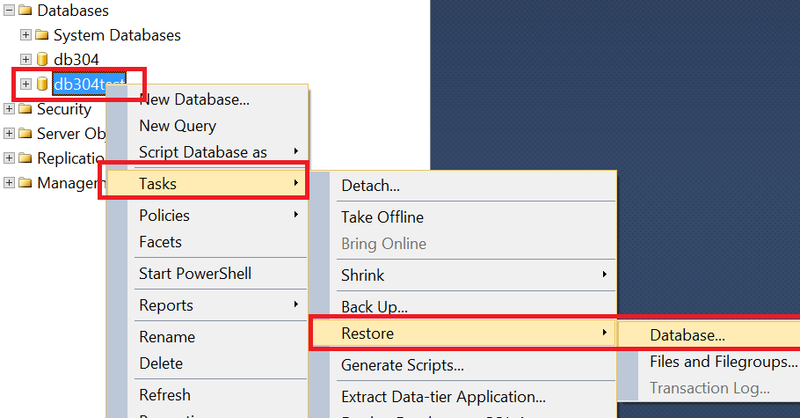 How to restore to a different database in sql server? copy a database within SQL Server Express? 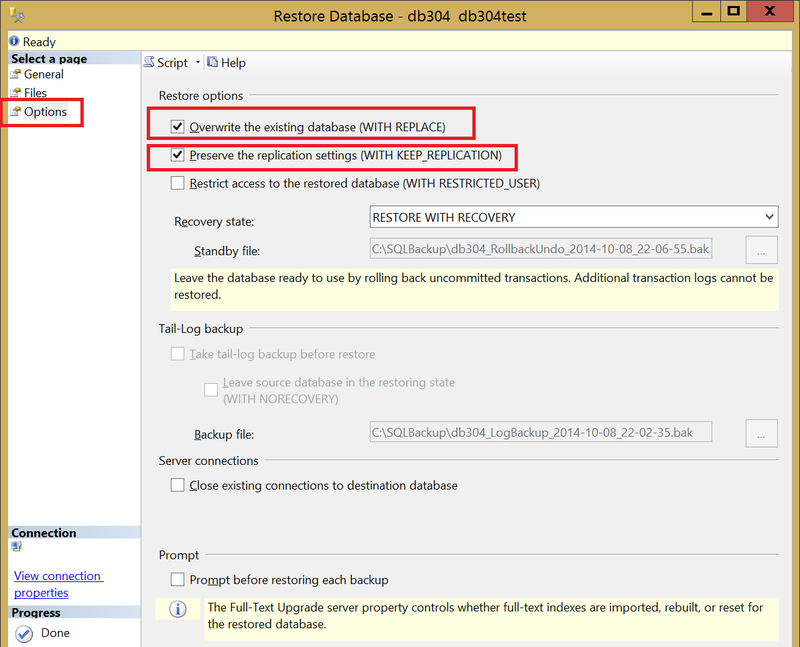 How can I restore a database backup file (.bak) from SQL Server 2012 into SQL Server 2008 Express?